My mom's birthday just past, and I never know what to get for her for her birthday, so I had the idea I'd make her favorite hot wings for birthday dinner, and order some Plated meals for this week. We decided on 2 plates of the Maple Brown Sugar Pork Chops with Brussels Sprouts Hash and 2 plates of the Skirt Steak with Compound Butter and Pear Gorgonzola Salad. Plated always takes 1 day to arrive, it's shipped via FedEx. 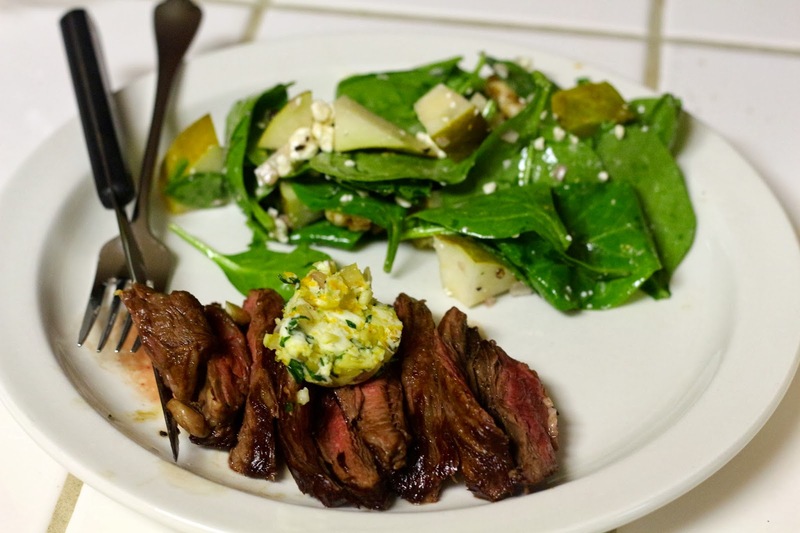 Here's the Skirt Steak with Compound Butter and Pear Gorgonzola Salad, the only thing I changed was I added a little of the orange zest to the salad dressing. I probably could have kept the compound butter in the fridge longer to get it to set more, but it was still delicious. And pear and gorgonzola salads are one of my favorites, so this was a perfect pairing! 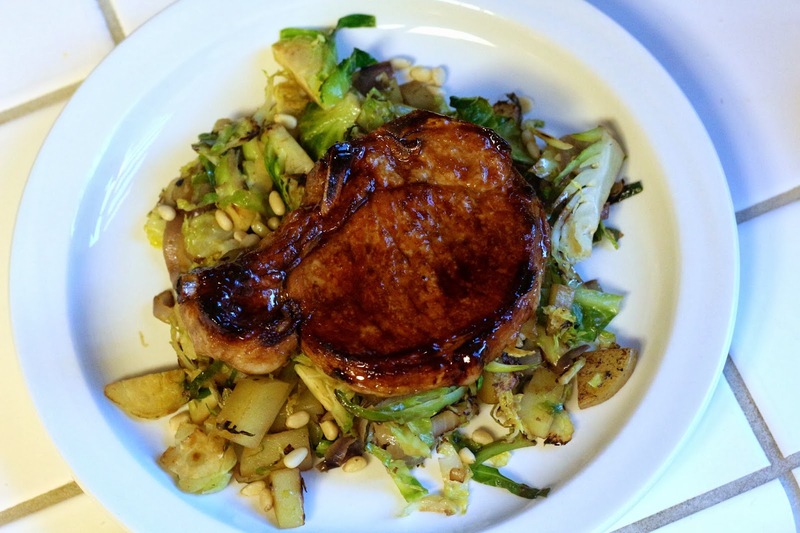 Here is the Maple Brown Sugar Pork Chops with Brussels Sprouts Hash which was also delicious. The hash portion of the dish made so much! We had plenty for two people, and probably could have served 3 people with the amount that I received. I loved the hash recipe, I'll definitely have to make that again because I love roasted brussels sprouts. What I love is that they offer usually 6 different menu items to chose from each week, about half that are vegetarian and half that have meat, and usually one fish/seafood item. I always pick the meat dishes because then I feel like I'm getting my money's worth, but the vegetarian dishes look great too! Have you ever tried Plated before? What have been some of your favorite recipes? Let me know in the comments!